(Written in Sanskrit as Krsna with dots under the r, the s and the n). The All-attractive One. Cowherd, warlord, lover, father, husband, friend and vedic sovereign. Vishnu-avatâra. Lord Krishna took birth in the Yadu-dynasty from Devakî with Vasudeva as His father. According many authorities was that in 3182 B.C. at the eight day in the dark half of the month Bhâdra or S'râvana (August-September). He was born in the prison where his uncle Kamsa had incarcerated His parents after he heard a voice from the sky predict that their eigth son would kill him (see S.B. 10.3). Kamsa (see S.B. 10.4) persecuted Him for that reason so that already in His childhood many demons were killed by Him as He grew up hidden from the enemy with the cowherds first in Gokula and later in Vraja near Mathurâ where he stayed in the forest of Vrindâvana with His foster-parents Nanda and Yas'odâ (see S.B. 10.8). A village with the same name is to the day of today with Him the place of pilgrimage and the center of Krishna-bhakti in the world. The girlfriend He had there so one says (not directly with her name mentioned in the Bhâgavatam though) is known as Râdhâ or S'rîmate Râdhârânî and the love of those two stands for the purest love of Godhead or personal love for God possible for a human being. The emotionality of that relation is called Rasa and offers for each a wide range of human possibilities to relate to Him spiritually (see also jalpa). 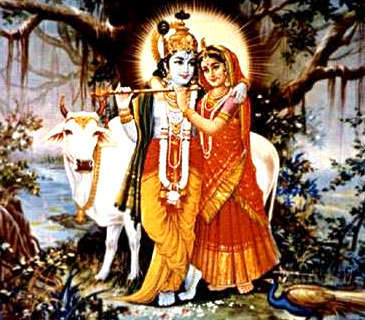 His relation with also the other cowherd girls, the gopîs, figures for the relation between Him and His devotees in the form of the different rasas. He fought all false rulers on earth and had as His life's mission to take the burden away from the earth. Next to Kamsa whom He defeated first (see S.B. 10.44), were later especially Jarâsandha (see S.B. 10.72) and S'is'upâla (see S.B. 10.74) and their associates His archenemies. He fought them always together with His half-brother Balarâma also called Râma, who was begotten by Vasudeva in another wife of his named Rohinî (see S.B. 10.2: 8) & (S.B. 10.8 :12). Balarâma is considered His first plenary portion with the same divine status as Him and seen as an incarnation of Sankarshana. For the sake of His mission, had He build a separate city in the ocean named Dvârakâ (see S.B. 10.50) and developed He, married to Rukminî and the 16107 (see S.B. 10.59) other wives He mostly liberated from being controlled by the scoundrels (i.e. Bhaumâsura) that He defeated, an enormous family of over a million members, the Yadus who, when all enemies were defeated, according His will at last fought against each other though, so that also they wouldn't burden the earth (see S.B. 11.30). He assisted His nephew Arjuna as his charioteer during the great battle of Kurukshetra when the entire Kuru-dynasty found its demise as a consequence of the injustice caused by family-attachments and favoritism (see Bhagavad Gîtâ of Order), the 'Song of God'; it is about Lord Krishna explaining to His friend Arjuna who he and He Himself really is. After the war disappeared Krishna to His heavenly abode (see S.B. 11.31) after being hit in His foot by an arrow fired by a hunter named Jarâ (see S.B. 11.30) shortly after the battle at Prabhâsa where as good as all the Yadus found their end. His life is described in the tenth Canto and His teaching He expounds in especially the eleventh Canto. The Bhagavad Gîtâ He spoke to His friend and nephew Arjuna on the battlefield is very similar to the yoga-teachings explained by Him in the eleventh Canto to His nephew Uddhava. For the former He did so to inspire to fight injustice, for the latter He did so to clarify how one should live on this earth with Him physically not there anymore. Râdhâ, girlfriend of the young Krishna. 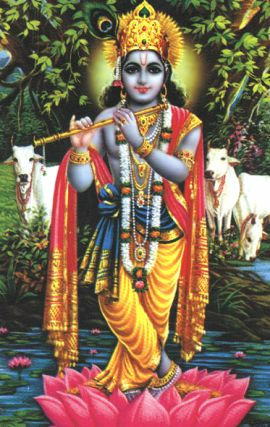 <br>She stands for the pure love of and for Krishna. He is recognized as the purusha (see S.B. 1.3), the original personality of Godhead from whom Brahmâ, the Creator originated (see S.B. 3.8). He is considered the most important, most complete and Supreme Personality of Godhead to descend on earth, who during His lifetime already was celebrated as such by His own family because of His great heroism and favorable influence. Literally His name means: dark, because of His dark blue-gray skin. He is, among other names, called Hrishîkesha as the master of the senses; Bhagavân as the Fortunate One of all opulences; as Mâdhava, as a scion of Madhu, as the blooming one and as our Sweet Lord; as Madhusûdana, being the one who defeated the demon Madhu; S'auri as the son of the mighty one, - knowing His father Vasudeva - and as the scion of an ancestor called S'ûra; Acyuta as the infallible one; Jagannâtha as the Lord of the universe (see also the Bhajan Jagannâtha Svâmi), the living being; S'yâmasundara as the beautiful one with the dark complexion; Kes'ava as the Lord who defeated Kes'i or else the lord with the beautiful locks of hair; Govinda and Gopala as the protector and pleaser of the cows; Mukunda as the Lord of liberation, Murâri as the enemy of the demon Mura, Vâsudeva as the son of Vasudeva and Lord of consciousness, Yogishvâra as the lord of Yoga; Yajña or Yajñes'vara as the Lord of sacrifice and Hari as the Supreme Personality, the Lord in person. And thus are many more names known of Him. (natural consciousness) is that state of consciousness that results from the devotional service to Lord Krishna. The knowing of Krishna or the condition in which one is aware of Him, knows Him, meditates on Him, works for Him, proclaims His glories etc. That consciousness that is brought about by following the principles of yoga (vidhis) and the chanting of the holy names (japa). That consciousness that is propagated and practiced by ISKCON, the western branch of vaishnavism as founded by S'rîla Prabhupâda. Natural consciousness. The respecting of Krishna as the Original Personality in His first manifestation: the complete of material nature (see purusha). Consciousness of true time as presented by the light of the moon, the sun and the celestial sky (see also Full Calendar of Order). Krishna as the impersonation of Time and the order of the luminaries moving around in the sky. (S'is'umâra, see also S.B. 5.23, kâla and vâsudeva). - The name of the hero and teacher in the old vedic times before He was known as the Vishnu-avatâra (see e.g. S.B. 6.9: 44 & 45). - The name of a King predicted to Rule in Kali-yuga for the Kuru-dynasty in decay then (see S.B. 12.1: 21). The Story of the Fortunate One: the Krishna Bible with His Life Story (tenth Canto). S'rîmad Bhâgavatam Treasury: All the standard songs and other bhajans composed by the vaishnav âcâryas and others, arranged to the original melodies, with chords and running translation.